As people age, the nucleus pulposus may naturally dehydrate. Like a tire that loses air, its ability to absorb shock is lessened. The annulus fibrosus weakens and begins to tear. This may not cause pain in some people. 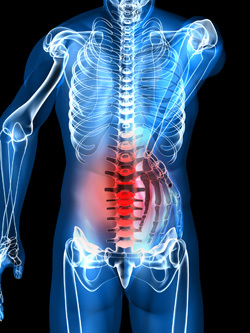 In others, it may cause chronic pain, known as axial pain or disk space pain. Gradual dehydration of the nucleus pulposus is called degenerative disk disease. What is a Disk Hernia? Like a tree branching out, major spinal nerves extend out all along the spine to various organs, tissues and extremities. Herniated disks often press against these nerves. These ‘pinched nerves’ cause radiating pain, numbness, tingling, and diminished strength and/or range of motion. Further, when the nerve comes in contact with the inner nuclear gel’s inflammatory proteins, a person may experience significant pain. Nerve-related pain is also known as radicular pain. When the disk protrudes into surrounding vertebrae, it is called Schmorl’s nodes.